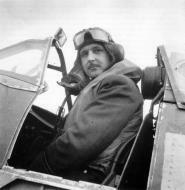 Squadron Leader R W Oxspring, Commanding Officer of No. 91 Squadron RAF standing on the wing of his Supermarine Spitfire Mark VC, AB216 DL-Z "Nigeria Oyo Province", at Hawkinge, Kent. 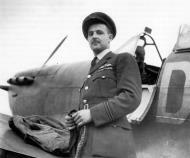 One of the first Spitfire pilots in the RAF, Oxspring fought through the Battle of Britain with No. 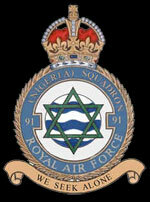 66 Squadron RAF. 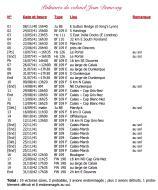 He commanded 91 Squadron from January to July 1942, and, after them, No. 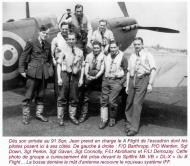 72 Squadron RAF with whom he moved to North Africa. He then joined the Staff at Fighter Command HQ before assuming command of 322 Squadron RAF in 1944. Oxspring led the Detling Wing until the end of the war, by which time he had destroyed 12 enemy aircraft.